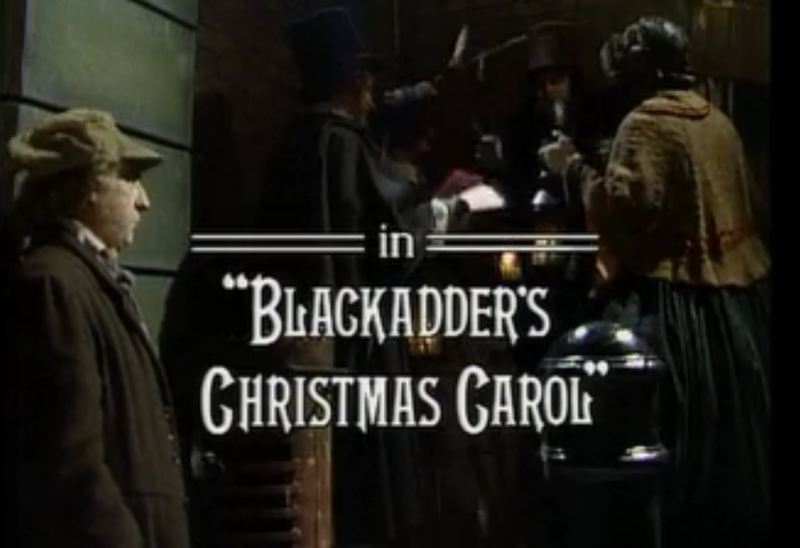 Les: Blackadder’s Christmas Carol is an episode of TV that’s a part of two long-standing traditions. First of all, it’s in the tradition of the Christmas special episode, one that British TV in particular takes very seriously as seen in series from Doctor Who to The Office to Downton Abbey. And secondly, it’s an episode that adapts Charles Dickens’s famous tale of three spirits in the night (condensed into one courtesy of Robbie Coltrane), which as The Simpsons adroitly illustrated back in “‘Tis The Fifteenth Season” no series is incapable of finding a new spin on. And speaking of those earlier Blackadders*, I can’t emphasize how damn good it felt to return to the worlds of Blackadder II and Blackadder The Third for a few minutes, spending some time again with Queenie, Nursie, Lord Melchett, and George the Prince Regent. It turns the special into as much a celebration of the series’ greatest hits (to date, at least—Blackadder Goes Forth was still a year away, or else we might have seen the Christmas truce play out). We even get a glimpse into the future, in a manner that only late ’80s BBC special effects could provide. *And there’s even a callback to The Black Adder, with Miriam Margoyles and Jim Broadbent popping up as Queen Victoria and Prince Albert. But again, lost opportunity to have BRIAN BLESSED come back as the Spirit of Christmas. Andy: It seems like a perverse fit, mashing up one story that’s become Western civilization’s byword for an optimistic view of human nature with another story that’s unremittingly cynical about same. But like a warm cocoa copiously spiked with rum, the sweetness is in the contrast. Even as Ebenezer’s anti-redemption pays immediate dividends, justifying his ancestors’ greedy nihilism, he’s still genetically doomed to overplay his hand. Blackadder’s Christmas Carol is still governed by the same moral universe as the main series—even if nearly everyone in it is petty, selfish, and crooked, karma still finds a way to balance the scales. The “flashbacks” to series two and three are a sharp way for Blackadder to take advantage of its quasi-anthology nature. Rather than a retcon of existing characters’ pasts (like Friends did a handful of times), these feel more like deleted scenes from distinct works, “hidden” tracks that were buried towards the ends of II and The Third and recently rediscovered. Seeing them right on top of each other—and right after viewing Goes Forth, an added layer for us that original audiences didn’t get—highlights the contrasts among the various shows and incarnations of Blackadders and Baldricks, as well as how the fundamental cores of the characters were preserved and reimagined in each successive series. It may not have been designed as a capstone to the Blackadder legend (as our next installment was), but it serves well as one nonetheless. Cory: I have a confession: I don’t really care for/about A Christmas Carol or the countless riffs on it we’ve seen from other texts. The original doesn’t really move me that much and its premise has been lifted and adapted so many times that it’s tough carve out space in the structure to make something new. However, what makes Blackadder‘s take on the familiar tropes and formula so successful is that it already has the structure in place to tackle the material in a smart, incisive way. The idea of going through time isn’t as silly or manipulative because the show has spent three seasons establishing that historical through-line, and like you gents have pointed out, returning to those various timelines is both purposeful and entertaining. Unlike other versions of this story that use the framework to convince characters to make manipulated changes in their life, this episode subverts and attacks that idea while still managing to reinforce it at the same time. Noel: First confession: I’m with Cory in that A Christmas Carol doesn’t really move me a whole lot these days (apart from A Muppet Christmas Carol, but that has the Muppets, and as such is immediately better than any other adaptation). Second confession: I realized I had never seen this special before (it wasn’t on the DVD set I borrowed years and years ago). As such, I was oddly surprised by it all. I was initially confused by this era’s Blackadder’s jocularity and kindness, and then I delighted in the show’s sly reversal of the tale (but still sticking to moralistic extremes, as Cory points out) to bring it all back full circle. But I think what I delighted in the most was Atkinson’s performance. There’s a little switch he flips after the Spirit visits, and this cloyingly sweet man just disappears into this horrible person we’ve come to love. His voice drops a notch, his verbosity takes on an edge, and his face contorts in different directions. It’s a nice study in performance from a comedic great. While I enjoyed and respected the hell out of Blackadder Goes Forth, I’m glad we chose to end our discussion with this instead. Rather than ending on the dark note of the big push, Back and Forth is a special that feels almost triumphant in nature. 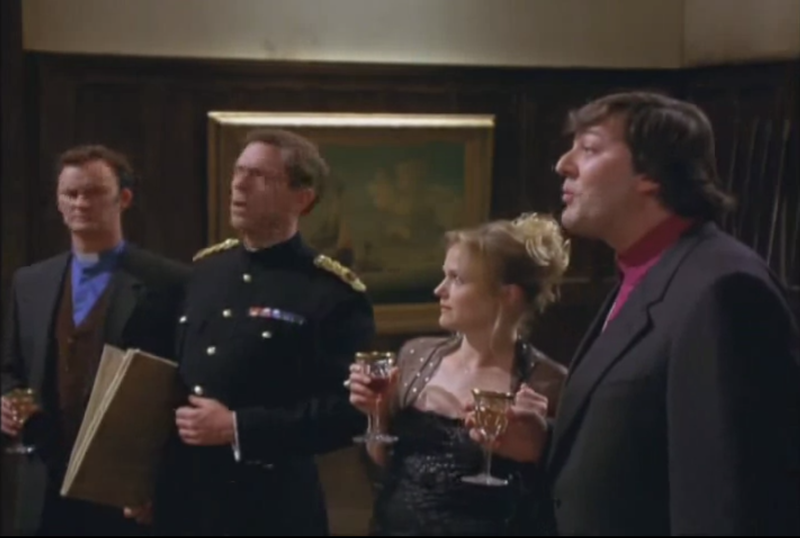 I don’t think it’s the best installment of the series, but there’s an energy to it that speaks to the fact that it was both commissioned as a celebration for the new millennium and a reunion of the Blackadder creative team after more than a decade since “Goodbyeee” aired. As a reunion, I feel like it closes out the Blackadder story very adroitly. We get to see the present-day versions of our favorite characters, and see that despite the passing of time the core elements of all remain unchanged: the bluster of Archbishop Melchett, fussiness of Archdeacon Darling, wide-eyed enthusiasm of Lieutenant George, and childish glee of Lady Elizabeth. There were some fine callbacks, particularly the species-ending powers of Baldrick’s underpants (which, were I a wagering sort, I’d guess may well be the same pair Regency-era Blackadder cautioned against exposing way back in “Nob and Nobility”) and the revelation that Roman strategies against the Scots were just as incompetent as World War I’s trench warfare. 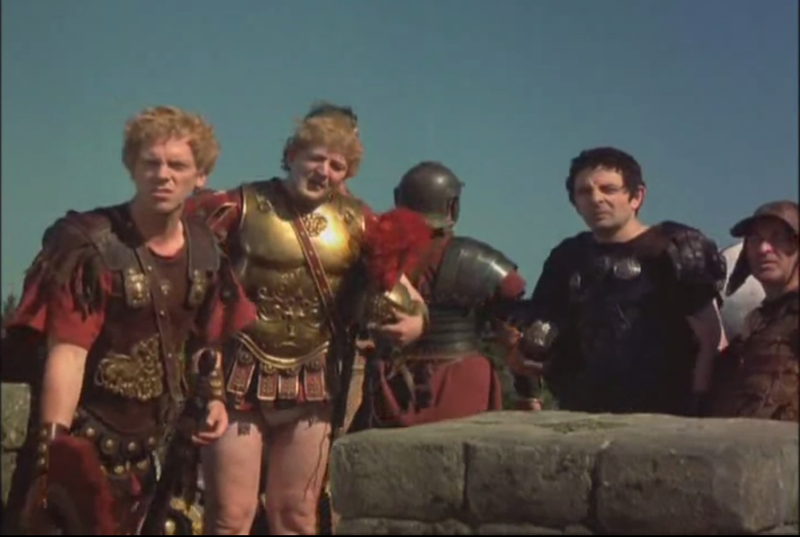 And even after all their earlier adventures, creators Richard Curtis and Ben Elton still found some versions of the characters we haven’t seen before, including Lord Flashheart’s reincarnation as Robin Hood and the Roman legionnaires among whom rank is determined by shortness of skirt. 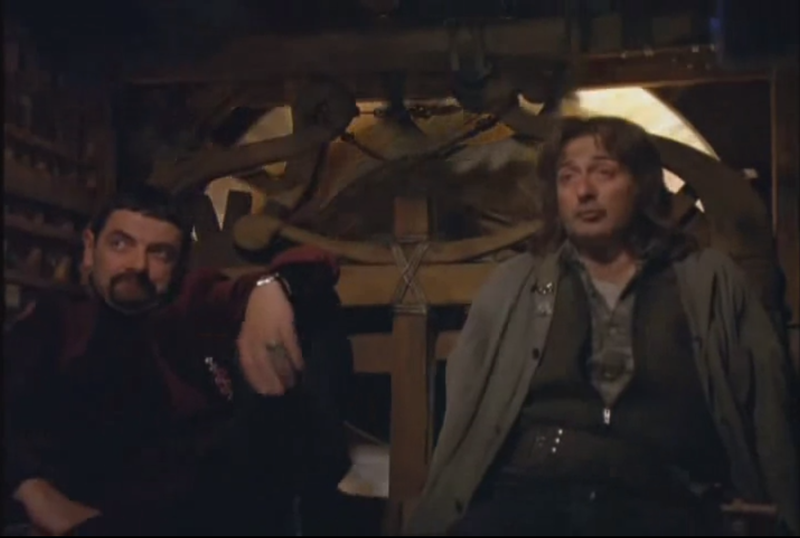 And honestly, there’s just a sense of fun about this special: Blackadder and Baldrick passing through time like a twisted version of the Doctor and his companion, causing no small amount of trouble in their hunt to make a bit of cash or just get home. Those two are a partnership as immortal in the British canon as Jeeves and Wooster (or even, dare I say, Holmes and Watson), and they deserved a great adventure filled with the insults and abuse we’ve come to expect. The ending feels like a culmination of everything that’s come before, the twisted ambition of Prince Edmund and the frustrations of Lord, Mr., and Captain Blackadder finally come to fruition in the plan “as cunning as a fox what used to be Professor of Cunning at Oxford University but has moved on, and is now working for the UN at the High Commission of International Cunning Planning.” We may have seen Blackadder and Baldrick lose at every turn for four series plus, but damn it, it feels good to see them win and win big. But before we wrap up this discussion, I want to pose a question to the group: which series/incarnation was your favorite? Personally, while I think I liked the preening smugness of Lord Blackadder in Blackadder II the best, I preferred Blackadder the Third overall as the most consistent series and the one with the sharpest regular cast in the Blackadder/Baldrick/George trio. Noel: I didn’t enjoy Back and Forth as much as I originally did. I think there are good bits, mainly the return to Elizabethan era and running into Shakespeare (“Who’s Ken Branagh?” “I’ll tell him you said that. And I think he’ll be very hurt.”*) and the brief return where Blackadder and Baldrick see the result of their original trip through the past. But, on the whole, some of the fire is gone for me, and I think I know why. *For the record, I adore Branagh’s Hamlet. I even purchased the DVD the week it came out. I miss the laughter. We haven’t once mentioned the laughter over the course of the series, that dreaded thing this day in age (“How dare this show tell me when to laugh! I’m soooooo much more sophisticated than that!”), but I find I really craved it during Back and Forth. There’s a rhythm to the show’s jokes that almost necessitate the presence of laughter, a pause for the jokes to land, and everything just feels off with out it. I noticed it really quickly, about three minutes in, when Baldrick appears in that ridiculous, pants-less maid get-up. There should be pauses for some of the jokes, and there should definitely be near endless laughter at the sight of his bare bum. But, no, it’s just silence. It’s still funny in parts, like I said, but it just doesn’t feel as funny. I doubt there’ll be much dissension on your question, Les. The Third is by far the funniest and most consistent of the series, and if its for sheer laugh factor, it wins, hands down. That being said, Goes Forth just feels so magnificently executed and “more important” that I feel like I have to give it an edge. But perhaps I’m falling victim to to its subject matter. Cory: Noel, your point about the move away from the laugh track and towards the more contemporary single-camera style is one that I kept focusing on while I was watching this. On one hand, I think it worked well for some of the things that the episode wanted to accomplish visually. It brought us the dinosaur and the Doctor Who-riffing spinning time machine, and it also allowed the production to include an increased number of on-location shots (the first since the end of the first series, right?) and provide an extra level of depth to certain bits, like the inside of the time machine. Without the transition to a different shooting style, Back and Forth couldn’t have accomplished those things—or at least not as well. But on the other hand, Atkinson, Robinson, and the writers seem more equipped to tell Blackadder stories with the “live” performance style in mind. The rhythm isn’t completely off but it is different. Baldrick’s lines in particular don’t seem to hit in the exact same way. On another note, I love time travel stories almost much as I’m unmoved by A Christmas Carol so it’s probably of little surprise that I enjoyed Back and Forth more than the Christmas special. Again, this episode uses the show’s historicity to its advantage, returning to previous timelines and characters while spreading out even further into the spectrum of time and space. The special taking potshots at Robin Hood and Shakespeare isn’t necessarily groundbreaking or unexpected with the show’s preconstituted historical focus, but it is flawlessly executed. Colin Firth’s Shakespeare is good but Rik Mayall’s Robin Hood is just awesome. That’s my favorite sequence of the episode and Mayall’s overblown masculinity works perfectly for this particular construction of Robin Hood. And somehow, Kate Moss isn’t awful. Although there have been rumblings (fake or not) of another go at this, Back and Forth is a fitting conclusion. Edmund and Baldrick finally get their successful posts, all the other goofballs are none the wiser, the show gets to return to its past and get in a few more licks about British history (making this a Who-like time travel episode is another great touch considering that character’s national importance). Would I watch more of Blackadder? Of course. But I don’t need more, this was a great conclusion. And if you guys can recall where I was with this show when we started a handful of weeks ago, it’s hard to imagine that I would have cared about these characters or this story at all. The first series was just that bad (so much so that I wish that this episode would have poked fun at how terrible it was—surely Atkinson and company were aware of the audience’s less-than-warm response, right?). And Les: Noel is right. The Third, for sure. I won’t be around for the next roundtable but I had a great time doing this. Glad I did. 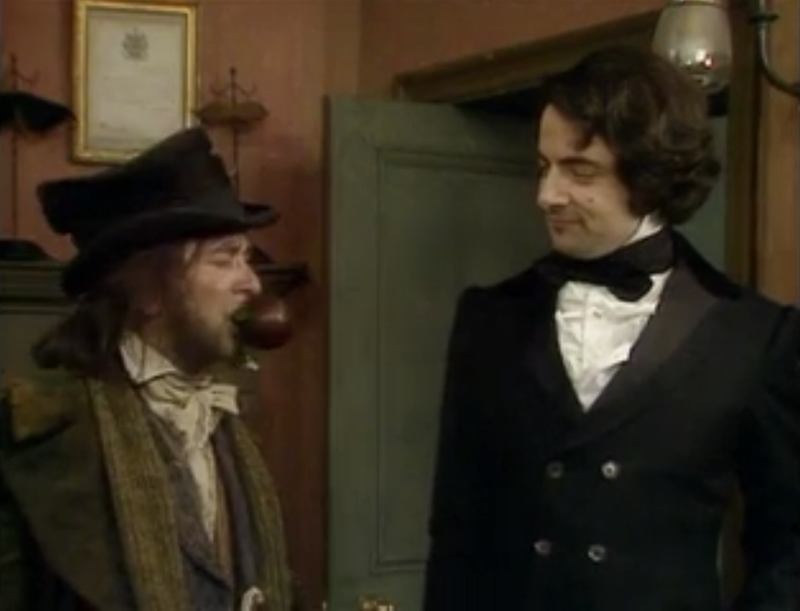 Andy: I agree that the absence of a laugh track is jarring, especially since the writing still seems tailored to accommodate one (with Baldrick’s domestic garb being the most obvious example of a sight gag begging for an audience response). But I still found this episode hilariously funny, more so than Christmas Carol, and honestly up there with my favorite episodes of the entire series. The callbacks were just faithful enough to work as homage while still fresh enough to find a new angle on the comedy. 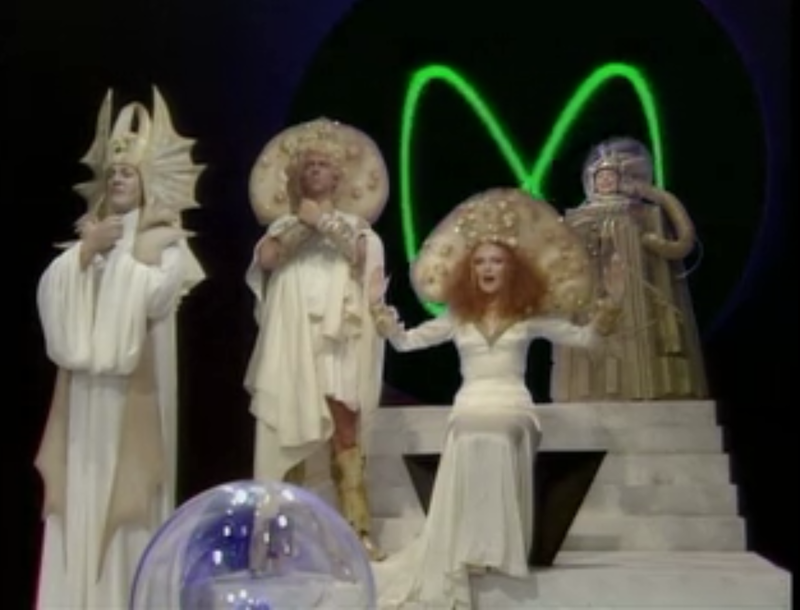 Transplanting the dynamic of Goes Forth onto a Roman legion, for instance, was a masterstroke both in bemoaning civilization’s repetition of fundamental faults across centuries and in displaying goofy people in goofy outfits. And Atkinson continues to find new notes to play in what is essentially the same character. He gives the 20th century Edmund a smaller, tenser energy (or more accurately a kind of anti-energy) that befits a gene pool thoroughly ground down by 500 years of dealing with dimwits. To answer your question, Les, I’ll diverge from the group and cite Goes Forth as my favorite. Third is certainly sprightlier, but Forth has Laurie and Fry and McInnerny at the tops of their games. I don’t think you can go wrong with any of the latter three series though. 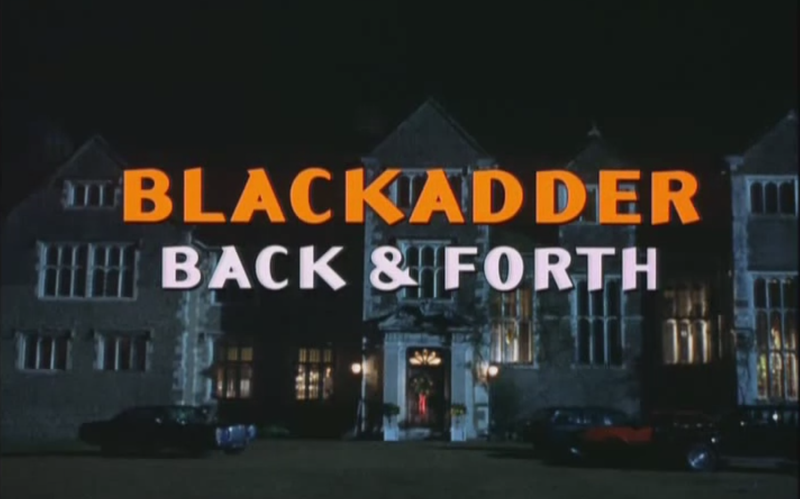 Blackadder has been in my catch-up queue for a long time, and now I’m glad to finally transfer it into my “rewatch ASAP” queue. 10/4: Alfred Hitchcock Presents, “Breakdown” (Season 1, episode 7); available through Netflix Watch Instant and Hulu. 10/11: The Outer Limits, “Demon with a Glass Hand” (Season 2, episode 5); available through Hulu. 10/18: Kolchak: The Night Stalker, “The Knightly Murders” (episode 18); available through Netflix Watch Instant. Absolutely right about the missing laughter in Back and Forth. But wasn’t Back and Forth shown in a stadium for New Year’s Eve or something awesome like that? I think the live audience would have supplied plenty of their own laughter in a situation like that. Plus, can you imagine a whole stadium full of people singing the Blackadder theme together? Thanks for the great, insightful trip through one of my favorite shows! I’m glad you all enjoyed it. Yeah, Back and Forth happened at the Millennium Dome, I think. I’m sure it worked well there. But replayed on a smaller monitor, all by your lonesome, I think it loses something. Sigh. I did alert you to that! At this point, I’m increasingly ready to call it the best thing Moffat’s ever written.